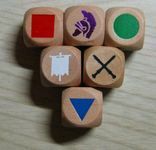 These dice made by Valley Games were approved by GMT Games for use in their game Commands & Colors: Ancients. These dice are 16 millimeter wooden dice with embossed symbols, rounded corners, and a clear coat lacquer finish. One set contains 7 dice. The manufacturer's suggested retail price has been listed at $6.95.